At the 2018 NABJ Convention & Career Fair in Detroit, our membership, partners and attendees look forward to a memorable experience that includes a schedule of dynamic and substantive programming. We will explore the future of journalism and media through the lens of technology, and preserving and protecting the public’s trust in news, information and media. What are the effective ways to use technology in journalism and media? What are the challenges and opportunities? What are the ways to protect and preserve the public’s trust in journalism? Programming at NABJ conventions prepare, freshen and strengthen our members and attendees to meet the demands of an ever-changing field of journalism and media. We are interested in reviewing quality proposals with focused and well-defined topics. Proposals should demonstrate relevance in journalism and media, including effective use of technology; best approaches to news coverage and story development; and, protecting and preserving the public’s trust. 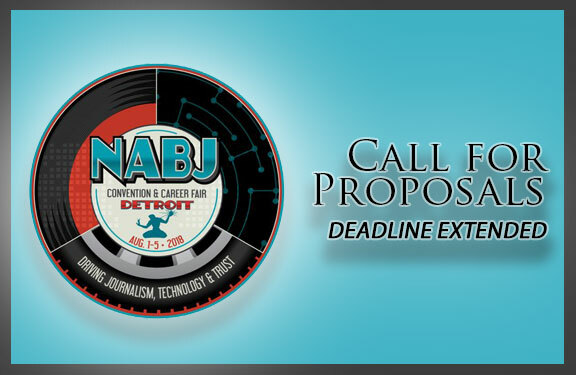 Only current NABJ members are eligible to submit general workshop proposals as part of the call for proposal process. Click HERE to review a helpful step by step guide to adding panelists to the workshop proposal submission. The extended deadline for submissions is Tuesday, February 20, 2018, at midnight PDT.